Shown with four sleeping kids, these fun family ornaments personalized to make them special can be lettered to reflect two parents and two kids or a combination that fits your family. 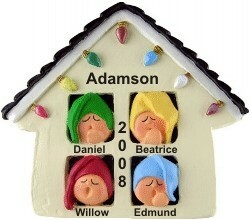 The Christmas house for 4 personalized Christmas ornament is delightful to the eye in its festive colors, and it will reach the heart with each person's name included. A holiday cord is attached to hang this pretty decoration wherever it will bring the most smiles. Celebrate the fun of the season this and every year with the Christmas house for 4 ornament personalized to be one of a kind. Christmas Dec 16, 2015 Lynn H.